AirSnore offers a coupon code at various times, (look towards to bottom of the home page) of up to 20% off (the current offer code is SALE20). 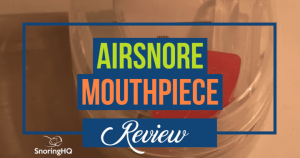 AirSnore is a fairly priced anti-snoring mouthpiece, for the features, and this discount makes it a good value. If you buy the mouthpiece by itself, with no sleep drops, the AirSnore is almost 50% less than competing anti-snoring devices. We don’t recommend the AirSnore sleep drops, in general, as the price is too high. You can purchase similar sleep drops, or Vapor Rub, at a much bigger discount than buying the AirSnore sleep drops. Alternative sleep drops or perhaps a spray will have the same or better results for your snoring.